Baseball star Al Kaline found himself in the late morning sunshine at Michigan’s Oakland Hills Country Club, but looking at his watch. He was about to play golf with me in the Ilitch Charities fundraiser, but had to be downtown at the ballpark for that evening’s Detroit Tiger game. While I was growing up, Kaline, who is 76, partnered with the late George Kell, as color commentator on Tiger television broadcasts. “I miss seeing you on TV,” I told him. It is one thing for Kaline to fly at his leisure to his home in Southwest Florida for the winter, which he does October through April, but quite another to be sent to places like Arlington and Kansas City in the heat of summer on Tiger road trips. Kaline, who collected 3,007 hits during his 22-year career, wore a cap bearing the logo of Leatherstocking Golf Course. I asked him where Leatherstocking was, and he was due the smile he gave when he answered, “Cooperstown.” Kaline is, of course, enshrined there at the Baseball Hall of Fame in that upstate New York town. 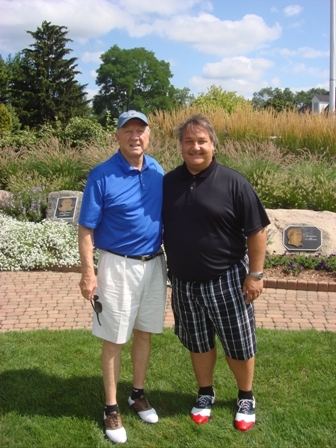 Oakland Hills was full of celebrities that day, including former National Hockey League star Darren McCarty. McCarty, the Stanley Cup with the Red Wings, smiled broadly at every word Kaline said to him on the terrace following the round. While Kaline is friendly, he is not animated. During the round, I tried to loosen him up with a practical joke by sneaking a rubber snake on the floor of his golf cart. After he climbed into his cart and noticed the rubber snake by his feet, he reached down, picked it up, held it in two fingers and looked at me coldly. Gotcha! It was like old #6 threw me out at home!